So we might say that they frequently eat corals and anemones, but that they are not obliged with regard to health and growth to eat corals and anemones, they can be raised and maintained on other feeds such as the SA Hatchery Diet. Can they be conditioned to eat prepared feeds such as the SA Hatchery Diet and trained not eat corals and anemones? Right now we would have to say that we don’t know! When we place a butterfly fish in a tank with aiptasia, for instance, the butterfly begins to feed on them. It might be that eventually a butterfly could be trained to prefer prepared foods. Is it possible to raise them from broodstock in a hatchery? The eggs are spherical and slightly transparent. Hatching happens in about a day and a half. The larvae retain the yolk with a fatty deposit. During the planktonic stage they are tiny, taking weeks to grow from about 1 mm to 5 mm. During this stage they eat copopods and other similar small zooplankton. Providing suitable first foods is a major bottleneck to commercial hatchery operations for breeding such fish. Where do butterflyfish range in the wild? Butterflyfish are mostly tropical, though some species are found in temperate waters. Most species are found in the Indo Pacific from the southern reaches of the Great Barrier Reef, East to Tonga and all the way up the Indonesian archipelago up to Taiwan. Thirteen genera and 113 species have been identified and named. There are differences among the species, but mature individuals of different species range from 4 to 13 inches. Like tangs, they hide in small spaces wedged in sleeping positions during the night and show dramatically different coloration, usually very dull. Their name comes from their front row of teeth: chaite Greek for hair, and odontos for tooth. They were thus named for the first time in science in 1750! They are often easily identified by their elongated mouth and jaw structure, which facilitates their feeding on coral polyps, anemones, and small invertebrates and plankton. Care level: moderate to easy! Most important issue is tank size and being careful about similar or same species tank mates. Food and water quality requirements are similar to other marine aquarium fish once acclimated to captivity. Tank: Generally a 50 to 100 gallon tank with a large amount of circulation is best. As with tangs, butterflies prefer some swimming space. Temperature: A good bet is to aim for 78-82F for temperature. Salinity should be in the range of 1.023 to 1.025 g/mL. pH should be close to natural seawater at 8.2-8.4. 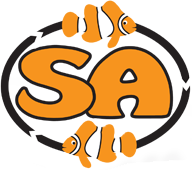 Food: Feeding a rich varied diet including meaty foods is the best bet; the SA Hatchery Diet works very well for us over long periods of grow out and maintenance. * The definition of an obligate corallivore would generally include that the species requires a major portion of its diet to derive from living coral polyps. In the ocean and most aquariums, this may seem to be true, but we and many hobbyists have found that most of these species can be trained to eat other types of prepared foods and live a long and healthy life in captivity without any coral tissue in their diet. It would seem in these cases that they are actually not obligate coral-eaters at all! *Hobbyists continue to seek-out these species due to their rarity and beauty, but the fish that come in from traditional wholesalers/transhippers usually don’t fare too well. They are delicate and tough to care for initially, so the average hobbyist may purchase many before they get one stout enough to survive and begin feeding on non-coral foods. We and our partner collectors target only small fish and then invest time and effort to make sure they are ready to go to stores and hobbyist’s tanks. This means that they have put-on weight and are already eating a variety of dry and frozen foods agressively; they adapt well if the care and time is taken with them. They also seem to learn quickly from their tank mates when it comes to eating. *The fish in this category that do actually make it from wholesale to hobbyist and survive are usually larger, more mature fish that we prefer to leave in the ocean as broodstock (the smaller fish are also cheaper to ship, using less space and fuel to bring from the reef to the US). These fish also seem to have a more difficult adjustment to captive life and diets (another reason for us to seek small fish). Due to the demand for these species, the collectors and indigenous farmers will collect these species regardless of their survival, so we educate them on the preferred size and quantity so as not to decimate the reefs and to ensure high survival of those that are collected. * When our fish are ready to ship, they are mature, fat, and healthy and eat a variety of foods so they survive very well in fish-only systems. Since they are already eating prepared foods, we do not recommend placing these fish into reef aquariums or offering live coral as food. *SA/SI does not harvest any wild corals; these are left in the ocean. Sustainable Aquatics has established many small coral farms that supply us with maricultured corals (the original broodstock for these having been collected from the reefs as cuttings). The farming racks full of corals serve as a refuge for small fishes settling out of the plankton, including small butterflies, of which we collect a few for our Sustainable Islands project.